This one's for all the 1D fans! I've had countless tutorial requests for these One Direction nails I did a year and a half ago, so I've finally done it. Here it is, and please subscribe to my channel ☺. I've never been obsessed with this band (I feel I'm just outside their target age bracket) but I do like their music. I even saw the movie, and enjoyed it! It'll be interesting to see what the boys are all doing in 10 or 20 years time. They've got huge lives in front of them, that's for sure. As you can see, for these 1D nails I've painted the Union Jack on the index finger and the Irish flag on the pinky. On the ring finger I've painted on Zayn and Niall's names, and on the thumb Harry, Louis and Liam's. Finally, on the middle nail I've painted the 1D logo with a little heart next to it - probably my favourite nail. Now I have a place to direct all the Directioners to when they beg for a tutorial! Seriously, I have never had nail art so repeatedly requested. If this one deems popular I'll have to do some more when their next album comes out. 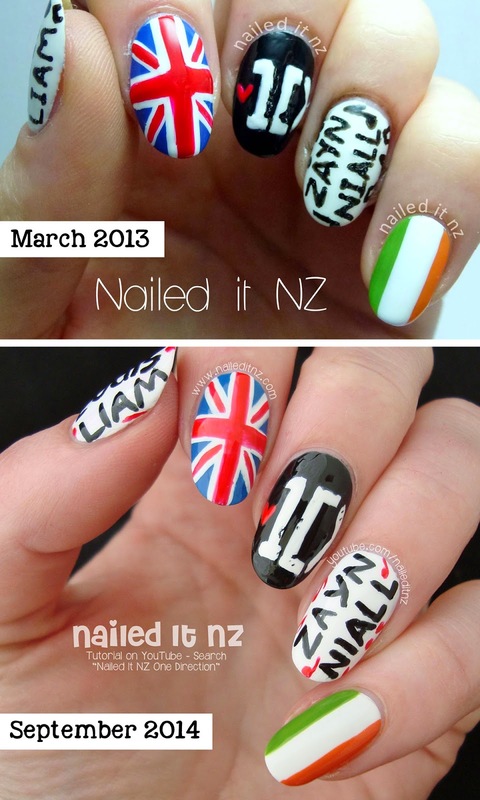 While writing up this post I realised that my photography has definitely improved since the last 1D nails! Whether your a fan of the 1D boys or not, I hope you like this nail art!